Flat Out Friday was Flat Out Crazy | Hupy and Abraham, S.C.
Register 220 racers in 11 classes, with riders coming from Tokyo, Montreal, California, Washington, Oregon and all over the Midwest, and you have Flat Out Friday. The race was divided into 11 classes which included Brakeless, Grom, Amateur, Vintage, Youth, Women, Boonie, Bultaco, Pro, Hooligan and Inappropriate. There were races for every taste and riders ranged from 8 years old to 75 years of age. 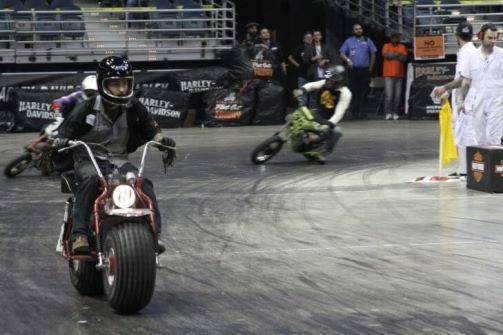 Instead of the usual dirt track, Flat Out Friday took place in the BMO Harris Bradley Center, current home of the Milwaukee Bucks professional basketball team. The arena flooring is taken up and the underlying cement is covered with a generous serving of Dr. Pepper syrup to make everything nice and sticky. The Bradley Center was chosen this year because this popular event already outgrew last year's Panther Arena with seating for just over 12,000. The Bradley center can seat 19,000, and there weren't many empty seats on February 17 as the racers stormed onto the track for warm-up laps. Pro racer Jared Mees returned riding his Honda to take top honors in the professional class final, getting the checkered flag in first place. Other winners were Louie Lauters, on a H-D Sprint, winning the Brakeless class, Cory Texter taking home the win in the Grom class, Dominic Cameron winning the Amateur final on his Honda, Eric Mischler getting the checkered flag on his Triumph in the Vintage class, and Elijah Tetzlaff took home the honors in the Youth class on his KTM. Women's winner was Zara Martens on her KTM, but there was a scare in the middle of the race. Brooke Chromy crashed with another bike and went face-down on the hard track surface. She remained still as rescue workers attended to her. Finally, she got up and walked off the track under her own power to the deafening cheers of the fans. That's one tough little lady. The Boonie class was taken by J.J. Flairity and the Bultaco class was won by Rober Smith. 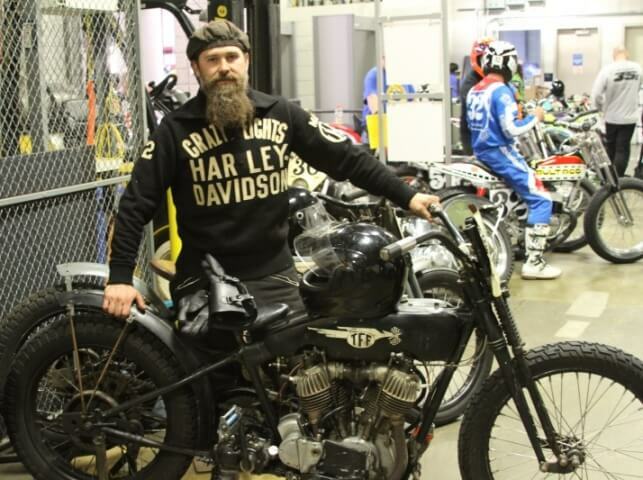 Rounding out the evening, Benny Carlson won the Hooligan race on his Harley-Davidson and Marko Lazarevic took home the win in the Inappropriate class on his Honda, one of the more entertaining class of riders. 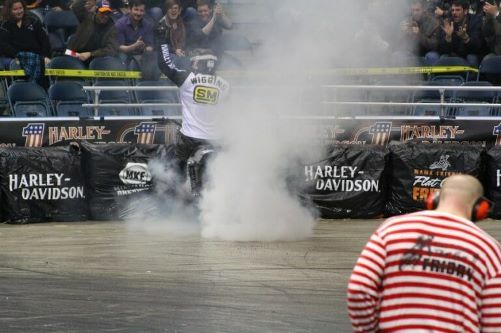 After a disappointing sixth place finish, Hooligan racer Chris Wiggins put on a tire-melting exhibition to the joy of the crowd. Meanwhile, Hupy and Abraham, S.C. sponsored a bike in the Boonie class, piloted by Pete Starich. The fat-tire Heald carried Starich to a sixth place position in the Boonie final. 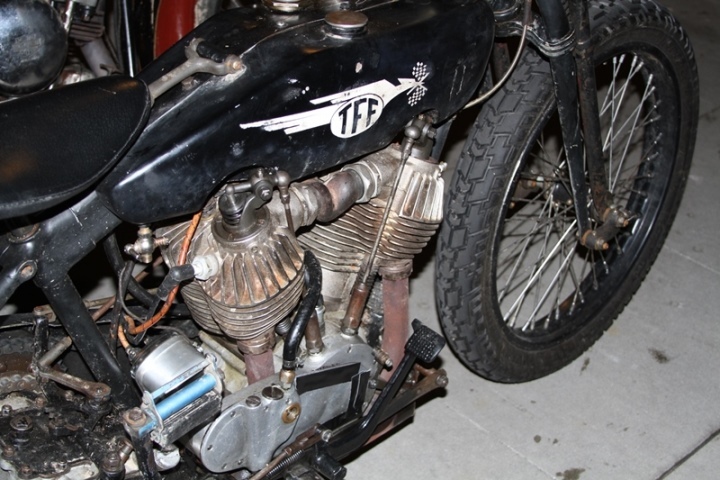 Flat Out Friday's excitement is the perfect way to kick off the weekend of fun, which included the flat track races, Mama Tried invitational bike show and the Slippery Sunday ice racing. Warm temperatures caused the official ice race to be cancelled due to open water at the McKinley Marina on Milwaukee's lakefront. But somehow, these crazy riders once again found ice on a nearby lake. Last year it was Lily Lake in Burlington; this year they found their way to Sinissippi Lake in Hustisford, Wisconsin. Watch for an article on that frozen fun coming to this forum soon. There were spills and thrills and at least one deep sea diver. Don't miss this one.